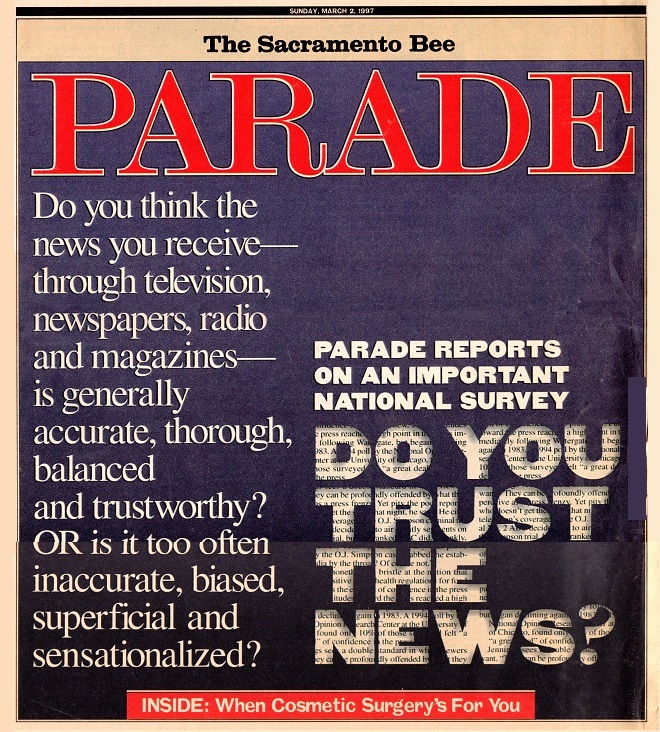 MARCH 2, 1997-DO YOU TRUST THE NEWS? Click on the image above to read this article in a PDF format. Some images on this page may be offensive. Viewer discretion is advised. Click on the image below to open a PDF file to view an article The Bee published. I wonder if the article was written to downplay all the stuff the Nordby's publicly do against the thieves at Raley's. This PDF file was sent to many at the Sacramento Bee. Above is a photograph of the Sacramento Bee main office located in downtown Sacramento. Fliers about Charles Nordby and Raley's were distributed out in front of their office building. While the Bee has arrogantly stated by their silence that they are the supreme power and decision maker of what news it brings forth in their newspaper, the Bee fails to realize that they have no control of what news is presented publicly-even if it is right out in front of their own office building. Also, the Bee fails to realize that because they don't have any good ethics, they are unable to publish this story. Overall, this may be the most embarrassing public newspaper in America today. Bought by their advertisers! 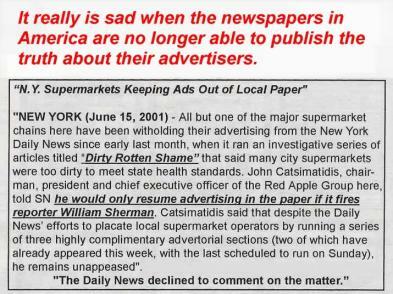 Click on the photo and you will be able to open up a pdf file and hear the Sacramento Bee's refusal to run an advertisement about this web site.. This letter represents just one of many the "Bee" has published from this same gentleman over the years. 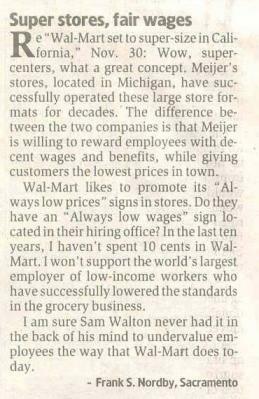 Not only will this man not support Wal-Mart, but he also won't support the biggest thieves in America!!! Raley's is the only supermarket chain in America to have a web site like this. That's because Raley's is top fraud. The Bee doesn't put that many articles about Joyce Raley Teel and Jim Teel in their newspaper anymore. 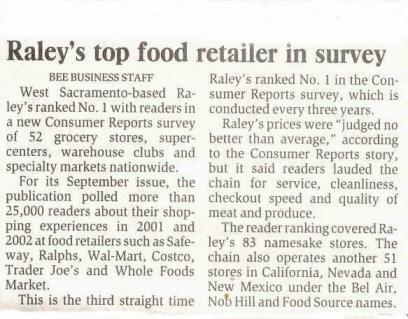 It would be appropriate for The Sacramento Bee to give their readers the truth about Raley's and their friends at Raley's, and how Raley's actually became successful. 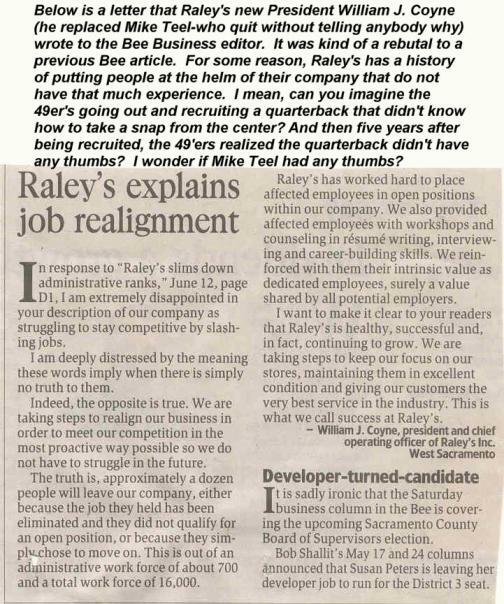 Back in 1991, the Bee published an article about Raley's and Collings that is totally inaccurate and misleading. It featured Collings as some kind of man with integrity, honesty, and a super authentic Christian. The Bee article also claimed that Collings was the most influencial man to Raley's success after Tom Raley made him President in 1969. However, the Bee doesn't seem to have any newpaper articles in their archives to show Raley publicly making Collings President. I wonder why? Below, you will see other articles found in the Bee's archives concerning Raley and Teel. And by all accounts, Raley should have promoted his son-in-law Teel to be president in 1969. Also, there didn't seem to be any Bee article proclaiming Raley's marriage to Joan in 1973. Raley's had a lot of important things happening to them in 1973 that they didn't want the public to know about in their history book. It was obvious why they didn't want to mention Charles Nordby in their history book. However, Joan was Raley's second wife, and there was absolutely nothing mentioned about his marriage to Joan in Raley's history book. In fact, after Raley passed away at the end of 1991, the Bee newspaper didn't even mention Raley having a second wife named Joan. And this is the newspaper in Sacramento that likes to promote the phrase "the public has the right to know the truth." Hard to believe all of Northern California could have been so misled by Raley's. 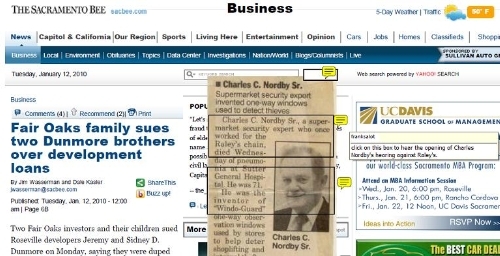 The Sacramento Bee refused to accept the top ad from Nordby, but the Bee accepted the bottom ad from Raley's. It wasn't until Raley's history book is published do they indicate how much money the Miracle Marts were losing. So, if they were losing so much money, why did they care if this furniture store operator used the word Miracle? Was Tom Raley suing this guy because he and Collings were looking for money? 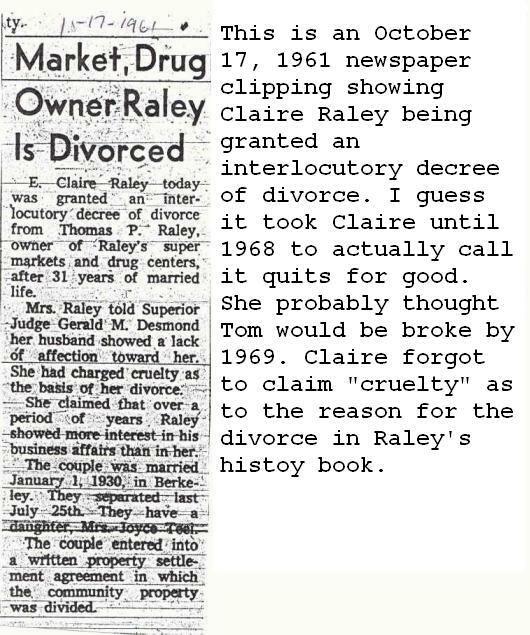 In Raley's history book, Claire Raley made a reference of being divorced in 1968. Why didn't Tom Raley promote Jim Teel to be his president in 1969? By the article below, it just appears like a no-brainer. Below is a page from Raley's history book. Read where Raley's says "These new people built elaborate offices, hired their own secretaries, and set up private little kingdoms within the store." These guys at Raley's could have been Church leaders. Here we go again. Another veteran journalist who should know better stands accused of reader fraud, deceit and fabrication. Again, the wounds are self-inflicted. Again, the credibility of the industry is called into question. Again, critics of the newspaper are given new ammunition to fire away. Again, readers are asked for forgiveness. The difference this time around is that the journalistic malfeasance occurred right here at The Bee. Or did it? To read Diana Griego Erwin's statement printed in Thursday's paper, she did nothing wrong, the sources in her columns that the editors can't find do in fact exist and that they will show up eventually. Yet she resigned, the trust destroyed between her and the paper. My response to her: Show us the goods. Think about the newspaper and your colleagues. Why have their hard-earned credibility besmirched - directly or indirectly - if you have the power to stop it, if you have the answers to the questions? "I loved writing a column for the people of Sacramento and I stand completely by my stories. The thousands of people I interviewed over the years know I do my job. This investigation came during a string of personal crises in my life when I wasn't at my best to deal with it and, frankly, I didn't have the emotional reserve to answer The Bee's questions quickly enough. I haven't set a timeline to answer the unanswered questions because I desperately need some time off to deal with private, personal matters." What can't be left dangling, however, is the paper's credibility. No one is above that. "This is a critical time for credibility in our industry," Rodriguez told the dozens of reporters and editors who gathered at 6 p.m. Wednesday in The Bee's newsroom to hear the announcement of Griego Erwin's resignation and some details of the internal inquiry. The litany of journalistic misdeeds in the last several weeks alone is enough to make you wonder whether we are in the midst of some dastardly epidemic that is destroying healthy journalistic brain cells or whether, like a bad remake of the horror movie "Invasion of the Body Snatchers," aliens have rewired journalists' circuitry nationwide. Preposterous, of course, but at least there would be something that poses as an explanation. From the suspension of columnist Mitch Albom at the Detroit Free Press for writing a column about events that never happened to the firing of Los Angeles Times reporter Eric Slater for a story about Chico State that contained sources that may not exist to the resignation last week of USA Today reporter Tom Squitieri after his editors said he lifted quotations from other newspapers without attribution, the list of infamy grows longer. What's perhaps most troubling is that because of the Internet and popular media Web sites such as the one run by Jim Romenesko, at Poynter.org, the glare of scrutiny has never been so bright. You can't fake it or confine it to your town anymore. A breach of ethics in Sacramento is now immediately known in Miami, or Philadelphia, or New York, or Fort Huachucha, Ariz. It's the new media landscape. Journalists who don't understand that or think they aren't being watched or held to higher public standards are naive and risking their credibility and integrity as well as that of their newspapers. The smart journalist is more vigilant about his sources, more careful with his facts, more attuned to ethical circumstances, even when, as is the case here, the first warning came not from the Internet but from an assistant city editor editing Griego Erwin's column on April 23. "I think we have to have a higher standard," Rodriguez said in an interview. "This is one thing the (newspaper) industry has to stand up for ... (the thing) that will set us apart is enforcing standards and having people trust us." "This is gut-wrenching to air our dirty laundry, absolutely, but we're trying to be as straight as we can." As was described to the staff Wednesday, the editors said that after questions arose about the April 23 column, they asked Griego Erwin to verify the accuracy of other columns and the existence of sources she had cited. They picked sources in Griego Erwin's columns that were considered the easiest for her to verify, that were in the paper most recently and that had names, ages and neighborhoods of residence clearly described. When she failed to provide the information that the editors had requested, the paper's inquiry went up another notch, and more sources and columns were questioned, eventually leading to Wednesday's resignation. What makes the pain worse is that The Bee had been on a roll. So far this year, it had won several of American journalism's highest awards, including a Pulitzer Prize for editorial writing, a Polk award for stories about the hierarchy of the California Highway Patrol abusing the state's disability retirement system and a Robert F. Kennedy prize for international photography for pictures of Hmong refugees. That's a very good year, especially for a regional paper like The Bee. Columnists at this paper lead a hectic and, for some, a grueling professional life. Griego Erwin was among the top-rated columnists in the paper's readership surveys. The pace is demanding, perhaps too demanding. Griego Erwin wrote three columns a week, a schedule that tends to keep writers on a fast-moving treadmill, quickly moving from column to column, a stress compounded when much reporting is involved. That invites the temptation to cut corners, to take short cuts. Perhaps the paper should throttle back its demands to two columns a week for those columnists who write three or more columns a week, minimizing the temptations to cheat and potentially leading to better reported and better written columns. It is at least worth a temporary trial. Meanwhile, we go back to where we started: Show us the goods. The Public Editor deals with complaints and concerns about The Sacramento Bee's content. His opinions are his own. You can contact the Public Editor by mail at P.O. Box 15779, Sacramento, 95852, by e-mail at publiceditor@sacbee.com, or call directly at (916) 321-1250.